Hi, I'm Erica. I'm an energetic, creative, and fun babysitter available! Hello. My name Is Erica. Me and my boyfriend recently moved here to Green Bay for his job as Roofing Contractor. I am a Babysitter and have been all my life. I am the oldest of 4 I have 3 younger brothers on that is 20 and the other two are 9 and 8. I was about 14 or 15 when my mother had the two younger ones, whom I took the most care of as infants and toddlers because my mother was a single mom and had to work so i have many years of child care knowledge. I had continued that learning in High School in a parenting class that my school offered. I am currently striving to be a physical therapy assistant but that takes money so I thought I'd continue with Childcare service. We are thinking of starting our own family soon so the extra practice would come in handy. My service are listed below on my profile. Price may change depending on how often I'm needed and what other jobs you need done but roughly $150.00 a week. Hi, I'm Erica. I am a housekeeper. 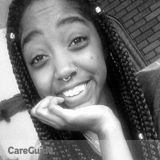 Young Woman, Elder Care Provider Available!